Losing all the data on your computer impacts your life a great deal, especally when you lose some important files. These could be anything from personal photographs, to business documents. Either way, losing your data is not an easy process to deal with. There are many ways that can lead to you losing all the data on your device. It can be as small as a virus, or as large of a catostrophy of smashing your device or destroying the hardware in some way. These are some of the most common things that cause data loss and can cause a huge hole in your life. A few years ago you might have had to live with the consequnces. Fortunately, there is now the EaseUS free data recovery software that can help you regain all your lost data. This data recovery software free is easy to use and will help you get your life back on track. How Does The EaseUS Free Data Recovery Software Work? The EaseUS comes with an easy to run three step system, that will help regain everything on your hard drive. The system works on memory cards, USB, SSD, Digital Camera, PC, Laptop, Hard Drives, etc. The best part about the EaseUS is that this data recovery software is completely free of cost. So you do not have to payup a huge amount just to get your files back. Step 1: Start with launching the EaseUs Free Data Recovery Software on your derive. This can be any device. However, the source needs to be connected to the device, so the software can recognize it; and help regain lost files. Step 2: Once you have launched the free data recovery software ti will start to scan the device and check the status of the lost files. You will get to view what the device once carried so you can check the files and their status. Step 3: The last step will allow you to recover all your files, so you can finally get back to your life without any worry. No matter if it’s about work or your personal life, you have complete access to it. So do not worry about a thing! This poweful photo recovery software can help you regain files that have been lost due to system crash, virus attack, hard drive failure, formatting, accidental deleted files, Raw parition, partition loss, and any other event that could have lead you to lose the files on your computer. 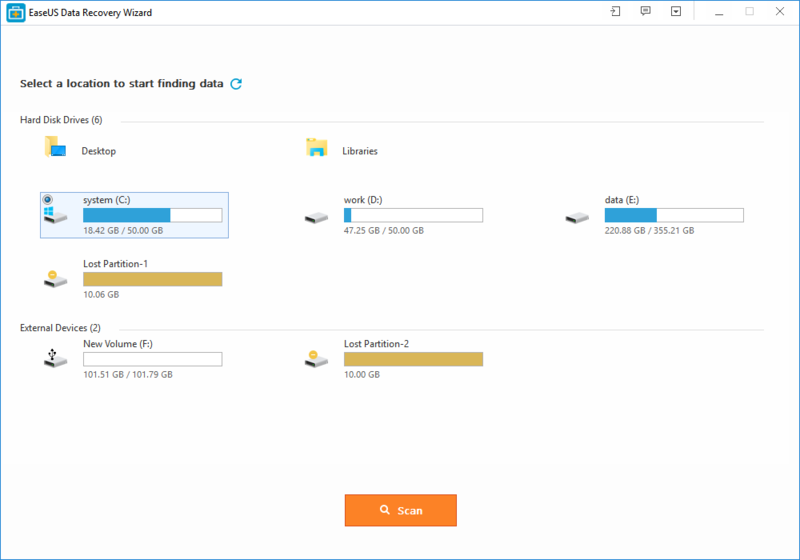 Why Use Ease US Data Recovery Wizard? The software is efficient and exact and can help you regain any file in question. It can help you preview the data so you only restore what is required. The software is free to use, so you do not have to worry about the cost. The software is flexiable so you can manage different files at once.